Just because it is Monday doesn’t mean we should feel blue. Of course, that is easy for me to say because Monday is my hubby’s day off, and we went out today, had a grand time with the kids, and got most of our Christmas shopping done. Win! Plus it is finally December 1, which means Christmas everything. Bring on the holiday nails! I’ve got a quick and easy look to share with you today. 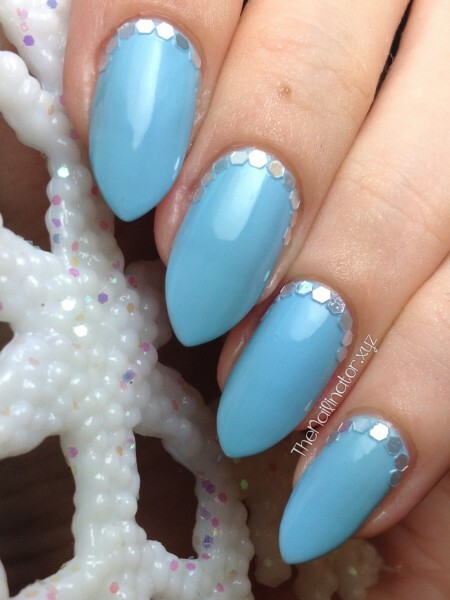 All it takes to do this is a pretty icy blue shade and some glitters. 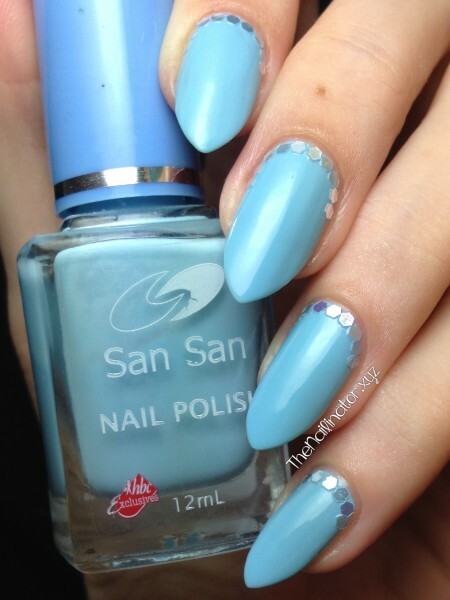 I started with couple coats of this lovely, light, icy blue polish, ironically named Warm Blue (by Sansan). I added a glitter ruffian flair with the pearly glitters from the hexagonal glitter set sent to me by Born Pretty Store. After applying the second coat of Warm Blue, I used a damp orange wood stick to pick up the glitters and place them where I wanted them. Then I finished with topcoat. Easy peasy! This was easy to do and ended up looking so pretty! I will definitely be doing this type of look again. The glitter adds just the right amount of sparkle. The colors I chose are definitely winter appropriate. I had a couple of people tell me they looked like “Frozen” nails. I can totally see Elsa rocking these babies and singing, “Let it SNOOOOOW”! Haha! Well, I hope you liked these. If you want to order the 12-color glitter set from Born Pretty Store (or anything else for that matter) you can use my coupon code for 10% off your entire order! I hope you have a great start to the week! Keep smiling! Let it go~ let it go~ Sorry. I couldn’t stop singing when I saw your mani. lol. I just love how simple and flawless this looks.